November 28, 2012, Auburn Hills, Mich. – Reliance One is proud to announce that they will be hosting a toy drive in support of the Toys for Tots Foundation. 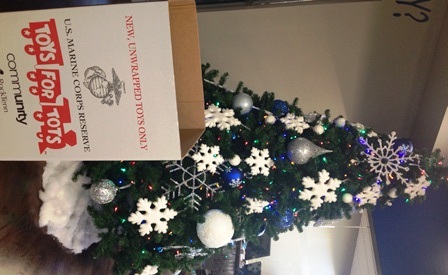 The company will be collecting new, unwrapped toys from now until December 17th. They’re asking that the toys be brought to the Reliance One headquarters located at 1700 Harmon Road in Auburn Hills. To thank you for your generosity this holiday season, Reliance One will be raffling off a $25 dollar Visa gift card to those that contribute to the cause. Each toy donated will increase the number of times your name is entered into the raffle! “The Toys for Tots Foundation is a wonderful program that supports an essential cause. I’m thrilled that Reliance One will play a role in putting smiles on children’s faces come Christmas Day” Vice President, Jim Paquette stated. The Toys for Tots program is run by the United States Marine Corps Reserve and all of the toys collected will benefit Detroit area children. Stop into Reliance One during business hours: Monday through Friday 8am-5pm. Do your part this season and be entered into the gift card raffle! Over the past three years, the Detroit Free Press has honored more than 150 businesses in southeast Michigan as a Top Workplace as assessed by the people who know best: their employees. The last two years Reliance One has been nominated as a standout business among top companies in the Detroit area. The results revealed Reliance One as 16th on the list, a significant jump from the 39th spot earned last year. “I think the new atmosphere attributed to our updated ranking, building an atmosphere where employees feel welcomed and can develop and flourish in their professional careers is a main objective at Reliance One” Commented Owner, James Paquette. The Detroit Free Press received over 1,000 nominations this year, with so many nominations it’s an honor to be recognized in the Top 20. “We are extremely proud at the fact that our employees think so highly of the company. Next year our goal is to be in the Top 10!” To see what sets Reliance One apart from the competition set up an office tour by calling (248) 922-4500. Where is the Coolest Place to Work? November 7, 2012, Auburn Hills, Mich. – According to Crain’s Detroit Business, Reliance One has been named one of the Top 10 Coolest Places to Work in Michigan. The company, founded in 1998, has come a long way from recruiting out of a residential basement. The newly built facility adheres to both employee and customer needs. The headquarters, located in Auburn Hills, offers state of the art technology for employee training, and individual interview rooms. The office provides a unique environment for employees to work in and even has an onsite exercise facility. In addition to the updated office, the company works hard to promote unity among staff members by having employee appreciation outings, bagel Friday’s, and team workouts. This culture is what helped land Reliance One their spot on the Crain’s Coolest Places. Jeff Gardner, Vice President of Sales was thrilled to find out about the newly acquired title, “We are very pleased that Reliance One has been selected as one of the Crain’s Detroit Business, Cool Places to Work in Michigan for 2012. Our company culture is very important as we continue to grow our client base throughout the Midwest. We have found that by empowering all employees, our company has created a positive work environment that has lowered attrition, created higher customer satisfaction and increased overall sales. It was a humbling experience to be mentioned with some of the top companies in Detroit and I would like to thank all of our employees for creating a great work environment.” The company was also acknowledged by Crain’s Detroit Business as one of the Top 20 Largest Staffing-Service Companies and the Top 30 Fastest Growing Companies within the State of Michigan. Reliance One is honored to be named a standout business and would like to thank Crain’s for the recognition.